Sascha Groschang (left) and Laurel Morgan Parks (right) will perform at the Lawrence Arts Center Saturday, Feb. 11. Combining art forms like string instruments and paintings to create a new perspective on music is one of the newest ways the Lawrence Arts Center is looking to engage the community. The Wires, a classical music duo from Kansas City, Missouri, plans to bring this enhanced art experience to life with its performance and display of visual art Saturday, Feb. 11. The event will begin at 7:30 p.m. 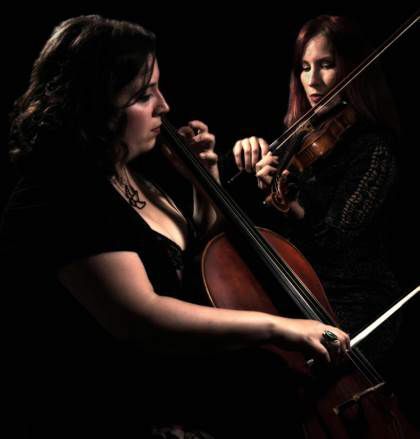 The Wires consists of professional violinist Laurel Morgan Parks, and professional cellist Sascha Groschang. The show will be accompanied by visual artist and painter Benjamin Parks, who will provide visual support to the music of the concert through digital projection. “We are hoping that a lot of people who are studying violin and cello will come out, because we think this will be very educational for them to see this kind of cutting-edge performance,” said Sarah Bishop, chief communications officer at the Lawrence Arts Center. The music people will hear from the The Wires is inspired by folk, nonconventional string music, indie rock, celtic and Appalachian music, according to Laurel. Benjamin, also Laurel’s husband, is involved with work in visual design, while also playing music on the side. For this show, Benjamin will have several of his paintings on display for attendees to observe before and after the show, Bishop said. During the show, Benjamin will project an image on a screen, which will line up and change with the mood and sound of the music played by Laurel and Groschang. Laurel said that the image and music will progress as if they are going through the seasons, starting with spring and ending with winter. Laurel said the duo first met while attending the University of Missouri–Kansas City Conservatory of Music, and they have been musical partners ever since. The event is $10 for University students. For more information, visit the event’s website.